Robert is a solicitor and notary public. Graduating from Aberdeen University in 1987, he practised first in Aberdeen for many years, before joining a long established legal firm in Forfar as partner in 1999. He became a member of Team Inksters in 2015. With over twenty five years experience in private practice, Robert acts for a wide range of clients throughout Angus and beyond. 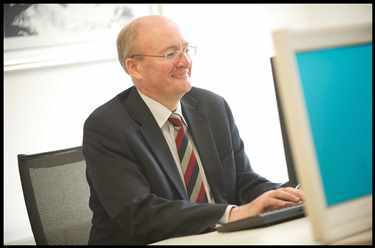 He is experienced in acting for individual and family clients in house sale and purchase as well as the preparation of wills and powers of attorney, and advises a number of businesses and local organisations in all matters including business set up, acquisitions and disposals, and the lease and purchase of commercial property. Robert has a particular interest in the agricultural and renewables sector and has successfully guided several of his farming clients in the funding and establishing of their renewables projects. Robert is married and lives in the Angus Glens. When not at work he enjoys the theatre, walking in the glens, and gardening. Contact Robert Wild on 01307 497 008 or send Robert an e-mail.